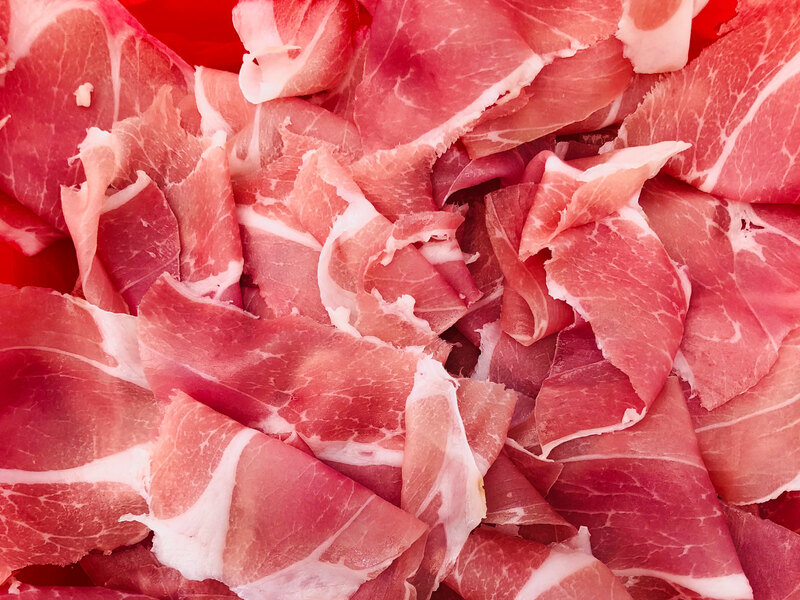 Here's how the wildly popular cured ham stacks up to prosciutto, jamon iberico, and presunto. 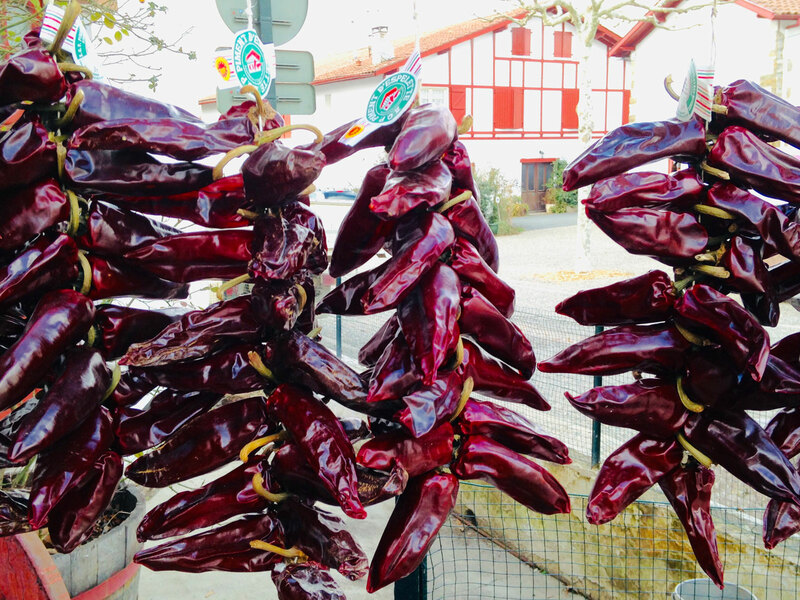 Bayonne, France—At 8:30 p.m., the summer sky is still bright as revelers dressed entirely in white and red stream into this small southwestern city, 30 miles from Spain. Over five days in July, during the annual Fêtes de Bayonne, more than a million people cross the Nive and Adour rivers, converging on the historic center, where the narrow cobblestoned streets are converted into makeshift open-air dining rooms and dance halls. Unsurprisingly, every chalkboard menu lists the namesake jambon de Bayonne. But, in fact, this regional staple is by far the most popular dry-cured ham in the whole country. That’s why I’m at this party: to find out what makes jambon de Bayonne so delectable and how it stacks up against other single-origin European hams, like prosciutto, jamon iberico, and presunto, all now available in the U.S. It turns out the Nive and Adour are especially significant. Bayonne, at the confluence, is a few miles from the Atlantic Ocean, and these rivers link the surrounding countryside to the coast and beyond. 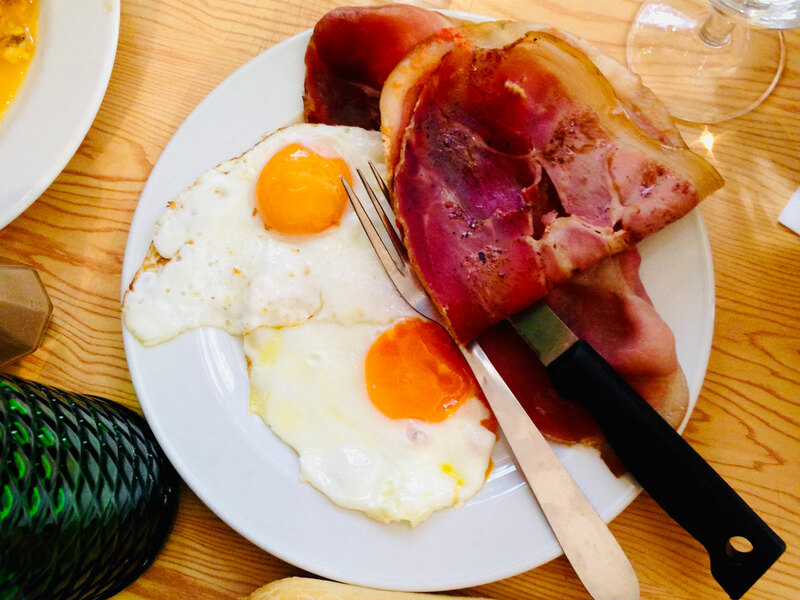 Also, the Adour, which swoops into foie gras territory, traversing Basque Country, the Landes, and the Béarn, marks the informal northern boundary of jambon de Bayonne production; the Nive, winding through the Pyrenees, delineates the southern limit. While the ham wasn’t historically fabricated in Bayonne (the coast is too humid for dry-aging), farmers in the southwest could easily ship their hams to this port city for sale or export. You could say the ham identifies as from Bayonne. Tonight, as part of a two-day ham-immersion situation, I’m wearing festival colors, too. Borrowed. I didn’t know about the white-and-red scheme. Unwritten rule No. 2: Bandanas aren’t knotted around necks until the comically oversized ceremonial keys are thrown from the town hall’s balcony to a teeming crowd below sometime around 10 p.m. on the first night. This cheering surge of humanity, kerchiefs now in regulation position, half-carries me past medieval arcades, quays, and squished-together, half-timbered houses, each animated by music every French person can sing along with—1970s pop star Cloclo, Abba, the Gypsy Kings, the Beatles. Eventually, I’m deposited at the tent of the Consortium du Jambon de Bayonne, the ham’s defending authority. Here, the cured haunches are everywhere—mounted on bar-top holders, resting on Berkel slicers, strung up on tent poles, enlarged on posters to preposterous sizes—and platters of the rosy meat arranged in petal-like slices just keep coming. It’s the charcuterie equivalent of a Champagne fountain. "You want to eat the fat. It's good." Chef Cédric Béchade of L’Auberge Basque, a Michelin-starred restaurant in the nearby town of Saint-Pée-sur-Nivelle, urges me on: “You want to eat the fat. It’s good.” Gesturing toward a luscious white ribbon, he says, “It’s what gives jambon de Bayonne its flavor.” I pop a slice in my mouth and chew. Amazingly, I don’t have to pick out any fat stuck between my teeth. The ham is meltingly moist, redder and less salty than Parma ham, and less pungent than Serrano ham. A deep and complicated character unfurls as I eat, with a whiff of hazelnuts. Béchade prefers the ham made from large legs, he says, because the meat is more succulent than on smaller ones, and they take longer to cure, which means more umami. Besides size, he explains, how thickly the meat is sliced also impacts taste and texture. Dainty shavings are sweeter, less salty, and more buttery than big, thick slabs. Upscale chefs like Béchade have imported the practice of serving ham raw and tissue-thin as a before-dinner bite with wine. But, locally, it’s traditionally cut into thinnish steaks and cooked. Across the street from the tent, at the Basque bastion Le Bar du Marché, the jambon has barely changed in any way that matters in 50-plus years. It’s griddled and plated alongside omelets, fried eggs and pipérade (here, eggs softly scrambled with tomato sauce and peppers). "Good pigs make good ham." Baile points out the almost 7,000-foot Col de Tourmalet, a particularly difficult climb in the Tour de France. The bicycle race is on everyone’s mind today as this afternoon’s stage passes through Arzacq, a little market town and home of the Maison du Jambon de Bayonne. This explains why I’m hustled through my next stop, a tour of the Salies-de-Béarn saltworks; we need to get to Arzacq in time to see the riders. 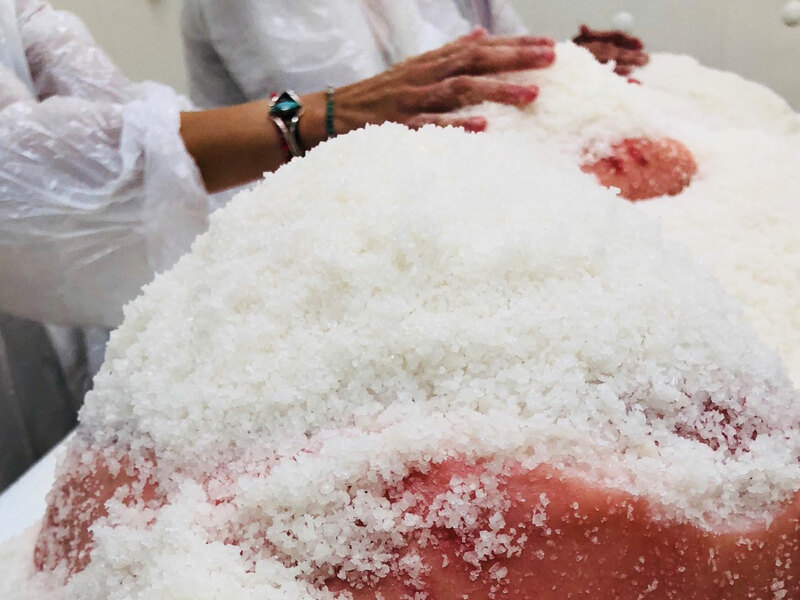 By European law, to make IGP (Indication Géographique Protégée) Bayonne hams, legs from IGP pigs must be cured in this artisanal salt with its own IGP. It’s produced in two Olympic–sized pools by gently heating spring water from the Pyrenees that’s 10 times saltier than the ocean. First, flaky fleur de sel pyramids appear on the surface, then they’re scooped up with a pool skimmer, the same way you’d remove leaves from your backyard pool. As the water continues to evaporate, the crystals get larger and sink to the bottom at which point they’re fished out with a digging crane. It’s weird that water pours off the coarse grains as the clamshell bucket lifts, because you expect salt to dissolve in water, not crystallize in it. Fresh ham, salt, air, and time. Consortium du Jambon de Bayonne director Pierre-Yves Alifat promises I can make my own ham in Arzacq. When we arrive, it takes me five minutes to suit up: hairnet, blue booties, a plastic lab jacket that covers my knees and a stop at the Purell station for hand washing. After this lengthy preparation, the process is simplicity itself. Jambon de Bayonne = fresh ham, salt, air, and time. Working at a stainless steel table, I massage a 20-pound bone-in ham with coarse Salies-de-Béarn salt. How much? How long? It doesn’t really matter, says Alifat; the ham will absorb as much as it needs. The particular size of the crystals, however, is critical; finer salt would “burn” the ham, toughening the exterior before penetrating the flesh. After a minimum of seven months—with an average of 10 months or, possibly, double that, per individual taste—the ham is tested for doneness with a pointy low-tech horse-bone probe and, when ready, stamped with a branding iron in the shape of the lauburu, the curvy Basque cross. What really sticks with me is how different communities across southwestern France, sometimes speaking unrelated languages, have worked together to create one of the most complex hams in the world. Today, with a vanishing population in rural France and in a landscape of increasingly large corporations, the Consortium du Jambon de Bayonne helps save a piece of provincial Frenchness, preserving an ancient social network, keeping farmers on the land, shoring up a small-town saltworks and providing local jobs—for festival organizers, restaurateurs, charcutiers, marketers, salt workers and corn and pepper growers. I’m not French but, in this moment, I share in the local pride. Somewhere in the Adour River Valley, there’s a ham with my name on it.